Most folks, during the winter season, turn on their heaters to warm their home. If you don’t have a central heating system, then you’ll need to purchase a space heater to give you localized warmth. When you’re trying to decide what size of heating unit to purchase, you really need to consider what kind of room size you have. After all, the size of a room will affect the heater’s performance and efficiency. Be sure to have a space heater than can handle more than the space… if you can. 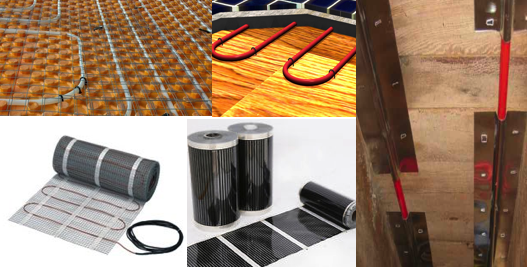 1 – Radiant Space Heater – One such option is the radiant heater unit, which changes electricity into heat by warming up the heat-conductive surface, generally a metal plate. These kinds of space heating systems will provide directional heat so that you stay cozy and warm. 2 – Parabolic Space Heater – This kind of heater, which looks similar to an electric pedestal fan, gives more directional heat and places the heat right on the area they’ve been pointed to. 3 – Pedestal Space Heater – This type of heater doesn’t efficiently warm a room but great for garage workshops and cold sheds… just enough to keep you cozy while you work. 4 – Kicker or Tower Space Heaters – These kinds of units provide a small area of warmth, and while they can increase a room’s temperature, they consume a lot of electricity than the convective ones. 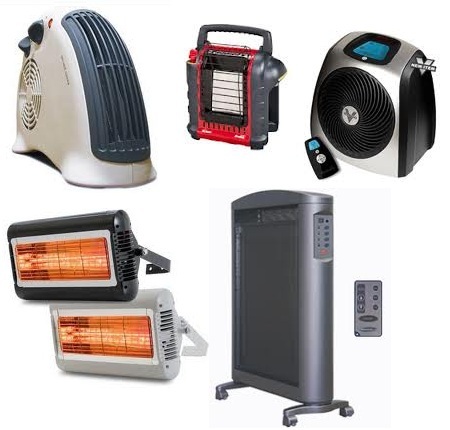 5 – Convective Space Heaters – This kind of heater will warm the room’s air through natural convection. It does this by allowing the warm air to rise to the ceiling, and when it drops, it cools down and generates the natural current. These space heating units will take additional time to warm-up and are very energy-efficient. If you want to lessen the carbon footprint you leave behind, this is the kind of heater for you. Just remember to turn down the thermostat by 10 degrees. Remember, heat is the cause of fires. So, all heating units will need to be handled carefully to reduce the chances of a fire. Of course, manufacturers have created a number of safety features to ensure space heaters are safe to use. One recommended feature of all the small area heaters is the automatic shut off feature. This is definitely ideal for cases where the heater has tipped over or when flammable materials have come into contact with the surface. Some heaters have been equipped with motion alarms, which will sound when the small sized heater has fallen over or is too hot. Either of these features is a wonderful idea to ensure safety during use. When in the market for a radiant zone heater, be sure to find outer grill openings that are tiny enough that nothing can get inside – paws and hands. When looking at tower area heaters, make sure you find ones that have a solid, heavy base to keep it from tipping over. Should your household include small children or pets, purchase a small ceramic zone heater to reduce the chances of tipping over. Convective small zone heaters can be placed near the wall. However, there’s still a chance of them tipping over. These area heating units are equipped with solid bases. Compare the heater models’ surface temperatures to locate one that’s best for you. Space heaters can be extremely worthwhile; but, before you begin shopping for one, it’s important to know the room’s size. Get both the width and length of the room, multiplying the numbers so you obtain the square footage. The majority of these small area heaters are rated for room size. Keep in mind that convective space heaters take a bit longer to heat large rooms. Small rooms can stay warm with a radiant space heater; however, convective space heating units will do a better job. Space heaters also have variable wattage settings and thermostats; this means you have better control over how much energy you use. Thermostats will give you control over the amount of heat it produces. Variable wattages allow you to control the amount of electricity the device consumes. Keep in mind that more wattage is needed to produce more heat. If you purchase a zone heater that uses a lot in a variable climate, it will cost less to work should it have a thermostat and variable wattage. If a space heater is only used on the cold days, you save money by foregoing the features. Two of the more energy efficient heaters are the mica convective and ceramic radiant heaters. After all, these devices use materials that can hold the heat in better. Thus, they don’t take near as much energy to get warm and don’t use as much energy to keep its temperature. When you want to decrease your carbon footprint and consumption of fossil fuel, these are the small area heaters you need to consider.